If spaghetti and lasagna were in a romantic comedy together they would eventually overcome their differences and end up like this: blissfully entangled for life, and better than the sum of their parts. Smash two Italian pasta favorites into each other and you get Cheddar’s Scratch Kitchen simple and smart signature entree: Baked Spasagna, a fulfilling dish that anyone who likes pasta—and perhaps even those who don’t—will happily devour. I realize that my hack must satisfy all fans of the original, and with 163 Cheddar’s locations in 23 states, this top menu item has many fans. Just the right amount of mozzarella and ricotta cheese is critical, so that every bite is perfectly cheesy. And the meat sauce should taste as good as the original, but it should also be easy to make. After boiling piles of pasta over several days in the lab, I think I finally hit on the perfect hack recipe for this great dish. And now you can try it out for yourself. Fire up the stove. Put on a pot of water. Our story starts with spaghetti. Get half a box of good spaghetti noodles into some boiling water and cook it until it’s done. I like using 1/2 pound of pasta for this so the finished product is mega cheesy like the real thing. But if you’d like to stretch out the dish you can use more pasta—up to 1 pound, or any amount in between. More pasta will give you taller servings that you can slice smaller to serve more people. While the spaghetti cooks, mix all this stuff together in a bowl: mozzarella cheese, ricotta cheese, half-and-half, salt, Italian seasoning, and garlic powder. When the spaghetti is done, strain it and mix it with the cheese mixture in a large bowl. Move all of it into a 9×13-inch baking pan that’s been coated with non-sick spray. But don’t pack it down too hard. We want the pasta to cook, but not dry out, so covering it is a must. Bake it until the pasta is beginning to turn light brown around the edges. Feel free to peek in on it. While the pasta is baking, you can make the sauce. Use a big saute pan like this so it can handle all the ingredients. You’re going to be adding two whole bottles of pasta sauce, so make sure there’s enough room. You can also use a large saucepan if you don’t have one of these. Whichever pan you decide to use, brown 1 pound of ground beef in it, and use a potato masher to break up the big chunks. It seems like I use this masher more often for breaking up ground meat than for mashing potatoes. Feel free to rename your kitchen tools whenever appropriate. When the beef is done browning, get it out of there and lightly brown the onions and garlic in the same pan. Don’t even wash the pan. The fat and flavor left over from the beef will contribute some wanted goodness. Now the ground beef can go back in there. This time it’s going to be snug, since you must also add 2 bottles of marinara sauce. I found Bertolli Reserva Marinara to taste very similar to what Cheddar’s uses, so try to get that one. Simmer it for around 15 minutes then turn off the heat and cover it. When the pasta has finished baking, slice it into 6 even portions. Add a generous portion of sauce to each serving. You have a lot of sauce, so go for it. Finish it off with a nice little pile of shredded Parmesan cheese. And that’s it. You’ve just cloned the top dish from one of the biggest restaurant chains in the southern U.S. Better pass out some forks. 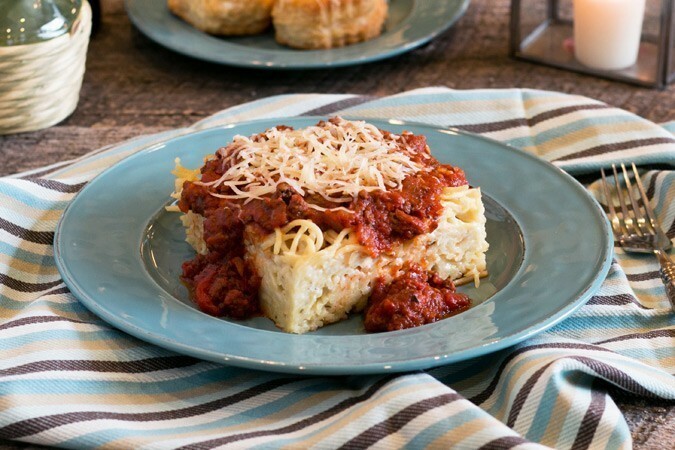 Make a home version of the famous spaghetti and lasagna mash-up. Bring 4 quarts of water to a boil in a large pot. Add the spaghetti and cook for 11 to 14 minutes or until done, then pour into a strainer and rinse with cold water to cool. While the spaghetti cooks mix together the mozzarella cheese, ricotta cheese, half-and-half, Italian herb seasoning, salt, and garlic powder in a large bowl. Combine the cheese mixture with the cooked spaghetti. Spray a 9x13-inch baking pan with a generous coating of olive oil non-stick spray. Pour the spaghetti mixture into the dish and spread it out with a spatula until it is flat, but don't pack it down. Cover the dish with foil and bake for 40 to 45 minutes or until the inside edges begin to turn light brown. Remove the dish from the oven and keep it covered. While the dish is baking, make the meat sauce by browning the meat in large saute pan over medium heat. Use a potato masher to crumble the meat into smaller pieces as it cooks. Drain off most of the fat, then remove the browned meat and set it aside. Don't wash out the pan since you'll be using it in the next step. You want it greasy. Add the onion and garlic to the pan and cook for just a few minutes over medium heat until the onion and garlic are beginning to brown. Add the meat back to the pan along with two jars of marinara sauce. Cook until the sauce begins to bubble, then reduce heat and simmer for 15 minutes. When you are ready to serve the dish, slice the pasta into 6 square servings. Place each serving on a plate and 1 cup of the meat sauce over the top of the pasta. 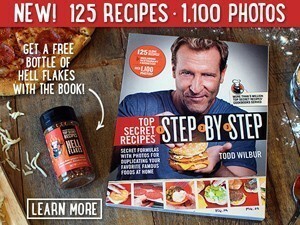 Sprinkle each serving with 2 tablespoons of shredded Parmesan cheese. You can store the pasta in the refrigerator for a couple days, then when you want to prepare each dish, simply microwave each serving of pasta for 1 1/2 to 2 minutes or until hot all the way through. Then spoon on the warmed up sauce, followed by the Parmesan cheese. If you would rather have marinara sauce without the meat, just eliminate the meat from the steps and cook the garlic and onion in a couple teaspoons of olive oil, before adding the jars of sauce to the pan. Can’t wait to try it never had the original but looks so good! Please recycle the tomato sauce jar and lid. I will make this. There is no way this can go wrong. Me, I’ll do traditional layering subbing spaghetti noodles for the lasagna sheets. It has to be easier. I make my own sheets. This is an awesome, 5-star hack. My family and I are big fans of Cheddar’s baked spasagna, and when I made Todd’s recipe we honestly couldn’t tell the difference between the hack and the real deal. My hubby told me to feel free to make this for him anytime! The only departure I made from the posted recipe was to use my own homemade ‘Italian gravy’ with meat as the sauce. This is soooo good. My family loves it, I will probably never fix regular spaghetti again.